If you’re gluten-free, chances are you’ve probably heard of amaranth before, although you may have been at a loss for how to prepare it. I started making amaranth porridge after reading Lorna Sass’s cookbook Whole Grains Every Day, Every Way . 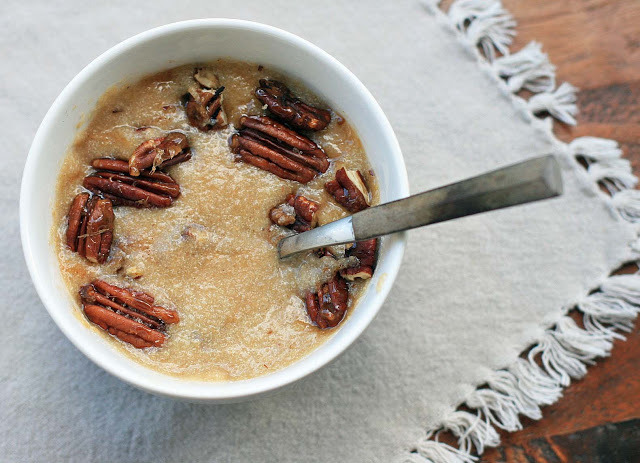 I absolutely love it with a pat of butter and a drizzle of honey; it has a slippery and smooth mouthfeel and is a really nice change from your standard oatmeal. But I hadn’t prepared it very often, mostly because it took quite a long time to cook. Well, I’m sort of embarrassed to say that it never occurred to me to simply grind the amaranth to cut down the cooking time. Now I can make it in mere minutes. 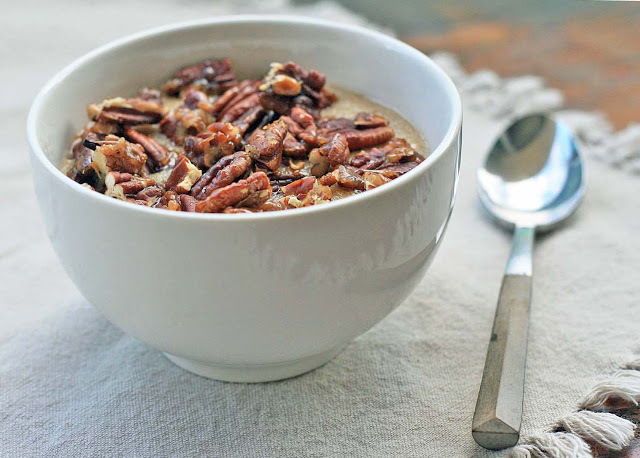 Topped with candied, cinnamon-spiced pecans, I think you’ll become a fan as well. Prepare the candied pecans by melting the butter in a large skillet. Add the sugar and cinnamon and stir. Let the mixture bubble until the sugar is dissolved. Add the pecans and stir to evenly coat. Remove from heat and use a heat-resistant spoon or spatula to transfer to a wax paper-lined cooling rack. When the pecans are cool enough to handle, break apart into individual nuts or pieces. Bring the water and the cinnamon stick to a boil in a medium saucepan. Reduce heat to medium and slowly whisk in the amaranth flour, to ensure that no lumps form. Cook, stirring constantly, until the mixture has thickened and starts to boil again. Remove from heat and take out and discard the cinnamon stick. Stir in the honey and butter, if using. Pour into individual bowls and top with the candied pecans.